The Dragon 2 Cam Set from DMM combines over 30years of design and manufacturing experience to create a state of the art cam that will make the most of every placement. TripleGrip cam lobes have a raw aluminium finish with additional bite points to create a greater contact area, this in turn, helps to increase friction between the lobes and the rock which increases holding power and reduces 'walking', particularly in slick or soft rock types. The dual axle, single stem design ensures 360� flexibility and a great expansion range which offers excellent performance and a better chance that you get the right piece the first time. 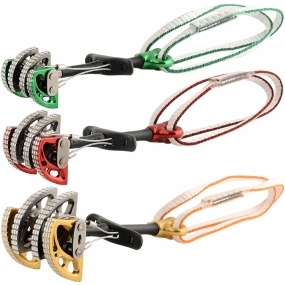 The hot forged thumb press has been carefully considered to help reduce the chance of fumbling with gloved hands or pumped fingers while the extendable dyneema sling cuts down the number of quickdraws you'll need to bring with you which significantly reduces the weight you need to carry on your harness making an all-round more enjoyable experience.